It has been recommended to Us that all of us consider some deeper penance than we have undertaken before now. Indeed the times are evil, and the necessity of doing penance for our own sins and those of others is greater than at any other time in history. Today the bridegroom has been taken away, so we should fast. The main message of Fatima was three fold. First to heed the advice of Sacred Scripture: “Afterwards, Jesus findeth him in the temple, and saith to him: Behold thou art made whole: sin no more, lest some worse thing happen to thee.” (John 5:14) Secondly prayer and thirdly penance. It is a general principle that we should never undertake an extraordinary penance without the permission of our spiritual director. A spiritual director is a duly authorized priest, who hears our confessions. However, we go deeper with this priest than going to confession. We uncover the workings of the Holy Ghost in our souls. Our inspirations and our struggles. With our spiritual director we uncover our predominant fault and undertake to overcome it with the help of the grace of God. All spiritual authors strongly recommend having a spiritual director, and if one is available to not have a spiritual director is at best foolish. However, they also say that if God deprives us of spiritual direction, He will undertake the direction Himself. The Holy Ghost will work in our souls, if only we let Him. We must be docile to His inspirations, which come mainly from our spiritual reading and the instructions emanating from the Church, such as this one here. It is better to be obedient to a spiritual director than to undertake a heroic penance in disobedience. Obedience is such an important virtue, that we must place ourselves under obedience to a spiritual director, if at all possible. When we perform an action or not under obedience, we can be sure that God is pleased with our obedience. If our spiritual director or any other superior make a mistake, the mistake is laid on their soul, not the soul of the obedient subject. Much could be said on this virtue of obedience, and indeed obedience is a necessary penance for all of us. Since, however, it is difficult to have a proper spiritual director relationship today, We shall recommend some ordinary penances that all of us should consider. As we read above: “sin no more, lest some worse thing happen to thee.” (John 5:14) Conversion is a complete change of customs and habits from our worldly way of living to the Christian way of life. And so our first and most important penance is to ask God to convert us, and then to cooperate with the Holy Ghost in this process. Yes, this is the work of God and He gives us all of the graces we need. The Pharisee bragged about his great penances as if these justified him. No, we change our way of life as did the Publican, then we begin our life of penance as we see in the quote we opened with from Jeremias. Fasting twice a week is good and tithing is actually required in some manner, because the Church needs our support. If our hearts are far from God, penance will do little good, except possibly to earn the grace of conversion. And so let us examine our hearts very carefully and remove all that is not of God. “The sacrifice required of every person is the fulfillment of his duties in life and the observance of My Law.” Jesus to Lucia dos Santos in 1943. Our first and most important penance is to fulfill faithfully all of our duties to Almighty God, His holy Church, our family, our own self, our employer, civil duties, etc. In fact, we cannot undertake a penance that will keep us from our first duties, as briefly outlined here. It is a good idea to sit down and examine our state of life and our duties therein and make sure we are fulfilling all of our duties. Some prayer books have such an examination of conscience in them. 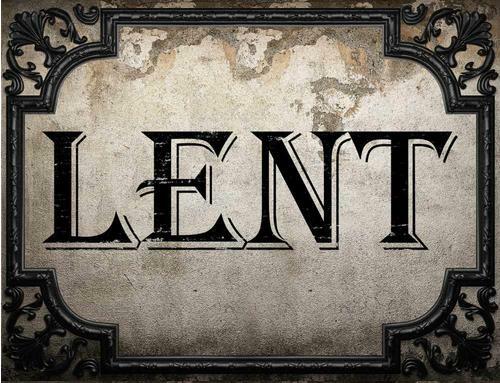 Lent is forty days in memory of our Lord's fast before His public ministry after His baptism. In the Ages of Faith Saint Thomas would write (Summa II-II, Question 147, article 6): “I answer that, Fasting is instituted by the Church in order to bridle concupiscence, yet so as to safeguard nature. Now only one meal is seemingly sufficient for this purpose, since thereby man is able to satisfy nature; and yet he withdraws something from concupiscence by minimizing the number of meals. Therefore it is appointed by the Church, in her moderation, that those who fast should take one meal in the day.” In the next article he discusses whether or not three in the afternoon is the appropriate time for the faster's meal, and determines that it is suitable. In the article after that he asks: “Whether it is fitting that those who fast should be bidden to abstain from flesh meat, eggs, and milk foods?” He determines that it is. To wish to feel no aggravation in fasting, is to wish not to fast at all. The current fast laws are even more indulgent, and it is sufficient to follow these. On days of Fast, only one full meal is allowed. Two other meatless meals may be taken according to one’s needs; but together they should not equal another full meal. On days of Partial Abstinence, meat and soup or gravy from meat may be taken once a day at the principal meal, even by those not obliged to fast. On days of complete abstinence, no meat or meat soup or gravy may be taken. Those not obliged to fast may eat meat several times on fast days which are not abstinence days of any kind. “Gluttony is a disordered love of eating and drinking.”, Saint John Vianney. We should consider that the modern world is a gluttonous world, and we all may have a tendency to gluttony. We should eat in order to live rather than live to eat. Therefore we should eat a healthier diet, especially on fast days. Moderation or even abstinence may also be desirable in the area of beer, wine and alcoholic beverages. One must remember that what is sold today as beer is not really beer in many cases, but some concoction resembling beer in taste. Real beer was called liquid bread and only contained for basic ingredients. It was nutritious, as is real wine. Wine is simply the fruit of the grace, which is crushed and fermented without any additives whatsoever. Wines, such as elderberry or blackberry wine are not truly wine. And many use white sugar or something equivalent in wine making, which also renders it not really wine. Fasting should be used to make us spiritually and even physically stronger. We should not fast to the point of rendering ourselves useless or unable to discharge our duties. We should also keep in mind the condition of our bodies and be careful. Let us remember that fasting is a tool to help us become saints and not an end in itself. Fasting does not make us saints, but fasting for the right reason and in the right spirit can help us become saints. We might consider following the fast law as it was at the time Mary came to La Salette. Some brave souls may wish on a day or two to actually fast as Christians did in the Ages of Faith a millennium ago. Many, however, have been weakened by the modern world and its obligations and should not fast so extensively, but there are other ways to do penance as we shall see. In this age, we should spend at least an hour a day in spiritual pursuits. We are bombarded by worldliness throughout much of our day, so we need to purify our mind and heart with spiritual things. Also we should minimize the world's access to our mind. Remember the maxim: garbage in, garbage out. Many of us waste time in keeping up with what is going on in the world, and yet our soul is far more important than what is going on in the world. We already meditate on material things. It is time we used that same talent for spiritual things. Meditation subjects are often drawn from books. Saint Teresa of Avila used a book for almost two decades. There is much to meditate on in Sacred Scripture. The purpose of meditation is to improve ourselves. We take some point and we form resolutions to carry on into the rest of our day. We form affections, loving what God loves. We make petitions to Almighty God for help to carry out our resolutions. If we have not taken up the holy practice of meditation, let us do so this Lent and carry it into the rest of our life. Lent is more than a time of penance, but a time to form good habits to carry on into our lives. Lent can be a spiritual spring cleaning, where we identify thing that need to be hauled out to the garbage. By reading and meditating we learn our duty; but by prayer we obtain the grace to do it. Saint Alphonsus. Could you not watch one hour with me? Jesus came and found the Apostle's sleeping, when He was in the garden. We need to form lives of prayer, which are founded on a solid hour of prayer each day. In the broad sense, prayer includes meditation and meditative reading. An hour a day in prayer is a minimum that we should spend in prayer. In our hour, which is best performed in the morning, we set ourselves into a spirit of prayer to carry on throughout the rest of our day. In this way we pray without ceasing. Saint John Vianney said: “Begin with God and end with God and yours will be the happiest life.” The first fruits of our day should be offered to Almighty God in prayer. We begin the moment we awake with prayer. Then after tending to the necessities of life, we should proceed to spend a notable amount of time with Almighty God in prayer as we have been considering above. Notice the Cure of Ars also tells us to end with God. How we end our day is quite important. We should end with an examination of conscience, especially in regard to the morning's meditation and resolution. This is also a good time to prep the subject for the morning, so we can sleep on it. How little service during the day or the week do we render God, and how much could we do? We should at least give a tenth part of the day to the service of God; for the same reason that a tenth part of the fruits should be given to God, should a tenth part of time be given to him. This we can do by hearing Mass, praying morning and night, before and after meals, examining our consciences once a day to see if they be stained and how we can cleanse them; to remember him daily and to seize every opportunity afforded by his creatures to praise him; to often sigh for our heavenly home, and to dwell on the thought of death and eternal gloom. But if we ask ourselves: Do we do all these things? I am afraid we must answer no. All our time we give to the comforts of the body or the pleasures of the world: sleeping, eating and drinking, walking, amusements and pleasures of all sorts. And what do we derive from all these? Hear St. Augustine on Ps. 89: "Our years shall be considered as a spider." "The spider," says he, "weaves his bowels the whole day to catch flies, but with no effect; so in the life of man, we seek possessions, we desire riches and every enjoyment, and at the same time we forget to weave the web of eternal happiness for which we have been created." Heliogabalus, the Emperor, ordered one thousand pounds of spiders to be collected for him; and it is said that he finally had ten thousand pounds saying: "Let it be known from this how great Rome was." How many to-day are hunters of spiders; who seek honors and riches which are nothing else than the web of spiders. But, you will say, I must look after myself and family, and I cannot give the time to the service of God. But listen to the decision of Solomon, who ordered the infant to be divided into two parts, and one part to be given to each woman who claimed the child. The soul, the nobler part of man, contends that the whole day should be given to the service of God; the body, the weaker part, claims that the day should be given to itself because it needs more. What is to be done? Let the child or the little while of life be divided and one part given to the soul; the other to the body. Although we can give the whole time to the soul and God if we direct all our actions to the greater glory of God. Notice that this priest recommends that lay people give ten percent of their time to Almighty God, which comes out to two hours and twenty-four minutes. If we keep track of our time, we will find that we waste far more than that, usually in front of some screen, so we have the time. It is time to redirect it. Later in the same sermon, he notes that Saint Teresa of Avila stated that the number of souls falling into hell in her day (sixteenth century) were like snow flakes. He also notes that few Christians are saved, which is the opinion of the Fathers of the Church and of the Saints. True we need to take a break, but we should use our recreation time wisely and for the purpose it was created. Recreation and rest are meant to restore us to the ability to do our work, whether it be the Work of God in prayer, or our daily work. Since the fall, our lot is work. What is your favorite book of the Bible? How many books of the Bible have you read? What are your favorite Scriptures? These are things to ponder. The Little Flower, Saint Therese of Lisieux searched the Scriptures to find an elevator to heaven. We can consider this briefly, looking at the various Scriptures. Saint Therese was already a little child in the presence of Almighty God, when she began searching the Scriptures for her elevator. We, on the other hand need to humble ourselves and become as docile little children before Almighty God. And so our little saint decided to be a little child. Thus God will take the little child as a baby in His arms. She thus concluded that the arms of Jesus are the elevator which will raise me to heaven. We also need to search the Scriptures. It has been recommended to read a chapter from Proverbs every day, the first chapter on the first, etc. Saint John Eudes recommends reading a chapter from the Gospels every day, while kneeling. Many of us are not well acquainted with the Scriptures, and we need to remedy this. If we look at the liturgy, one will find Scripture throughout. Not only do we have the Gospel and Epistle at Mass, but many of the readings are from the Scriptures. The same is true of the Divine Office. When we begin reading the Saints, we find them referring to Scripture quite often. First of all, let us ask Almighty God to change our hearts and to convert us. Next let us make sure we are doing all of our duties to Almighty God, our fellow man (especially our families, if we have children), and our own self. In fasting, let us make sure to follow the fast laws. We should consider exceeding them some what on occasion. We can eat a smaller quantity of food and simpler food than we are accustomed to the rest of the time.